Living in a world constantly on the go, holidays can creep up on you. It’s like they are hiding behind a wall and all of the sudden jump out and yell “Boo!” I am the queen of overdoing it on the holidays, especially in the food category. We are currently in the middle of moving, so my OCD holiday planning for Easter has gone by the wayside. A small brunch will still make an appearance, but the frills will have to wait until next year. Sometimes, you just need simple. Simple and delicious that is. 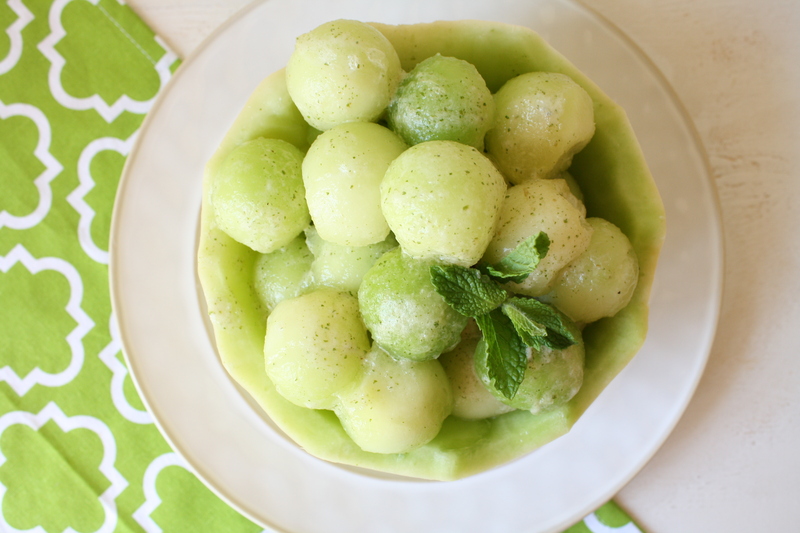 Insert Melon Salad with Honey Mint Dressing. Seriously 3 ingredients + 20 min = ready to devour. One of my favorite parts of this recipe is that you can literally use the whole melon, from the delicious fruit on the inside to the shell for serving it. Add a little mint and honey – Boom: super simple melon salad. Dress it up by carving a border in the top of the rind and add a sprig of mint for presentation. If you want to get super fancy without adding a lot of extra time, use two melons at different ripened stages for alternating colors of green. People will seriously think you spent way more time than you did on this dish. Shhhh…we will keep that little secret between us. This simple dish is a perfect addition to a very special Sunday. Easter is such a beautiful time to celebrate new life and renewal. 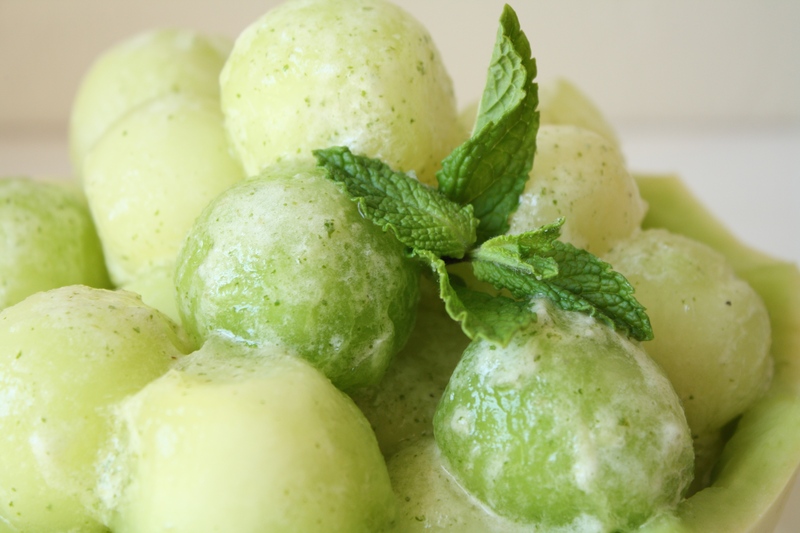 The bright green colors of honeydew paired with the fresh sweet taste of honey and mint are reviving and refreshing. It’s a great way to remember how much our lives are revived and refreshed through our faith in Christ. May you and yours have a blessed Easter season. Honeydew originated in Africa and are actually considered a member of the gourd family, like squash. The seeds were brought over to the Americas by Christopher Columbus and it has been grown here ever since. Honeydew is considered a winter melon, but it’s peak time of year is debatable. Many people consider peak season from August to October, while others maintain they are ripe in spring, starting around March. I started receiving them in with my produce this spring and they are delicious! We have also had a very warm winter which could make a difference as honeydew do not like to grow in cold or frosty weather. To pick a ripe melon, it should be firm and slightly sticky with a sweet aroma. The color should be a golden yellow with freckling. Avoid soft, white or green colored melons. Rich in vitamin C, potassium, pantothenic acid and Vitamin B6, they are great for the circulatory system. The vitamins, minerals and high water content are perfect for a developing child as well as women in pregnancy. 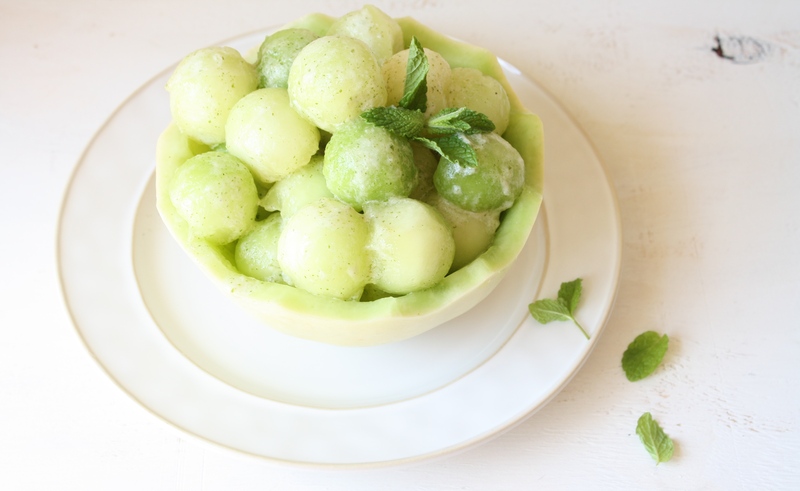 Because it is so rich in Vitamin C, honeydew may help the body prevent illnesses as well as keep the skin firm by conditioning the collagen, helping to maintain a youthful look. They are virtually fat free and low in calories so they are perfect as a replacement for dessert on a weight management plan. However, they can be high in sugar, so moderation is key if you monitor blood glucose. 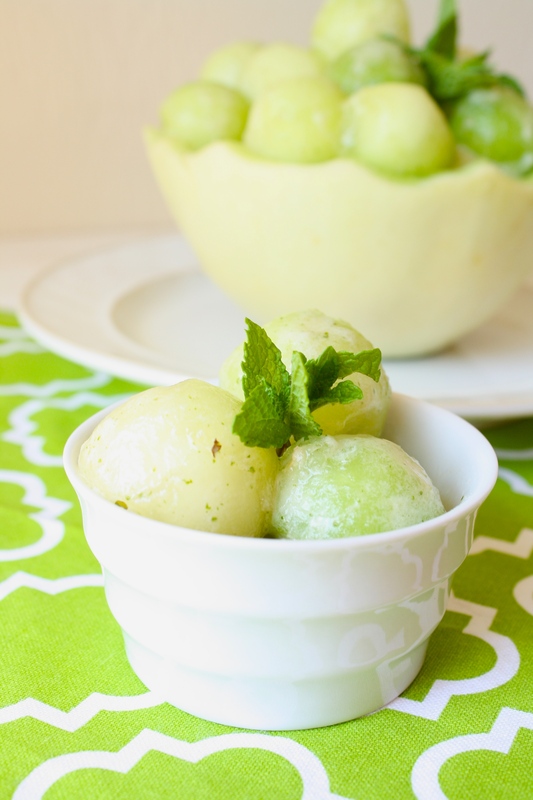 What is your favorite way to eat honeydew? Super simple 3 ingredient melon salad. Perfect for Easter! Cut honeydew in half. Scoop out seeds and discard. Ball melon out of both halves and place in a bowl. 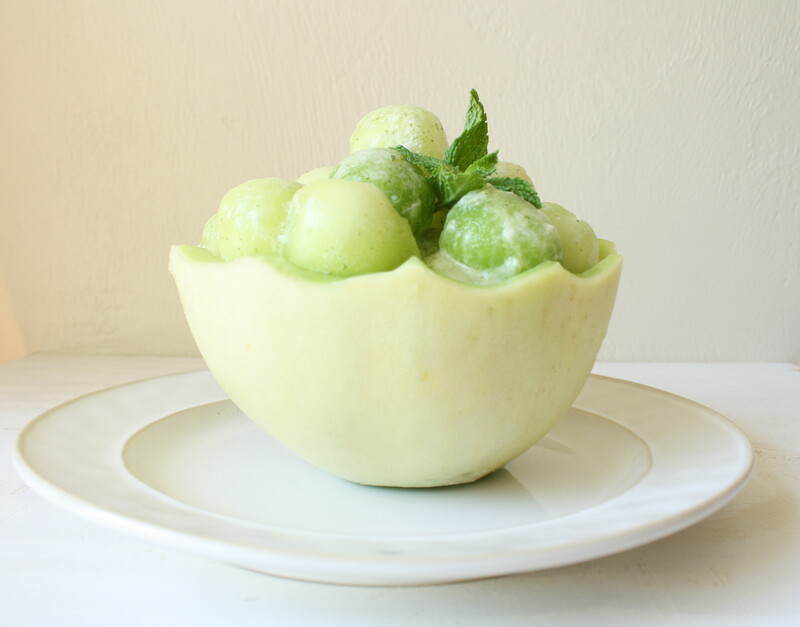 Save melon juice and any extra flesh from the shells and set aside in a small bowl. Reserve one of the shells, cut a small piece off the bottom to make flat like a bowl (make sure not to cut too far or it will make a hole and the dressing will leak out) and carve a design in the top if desired. In a small blender or food processor (I use a Ninja), blend 1 cup reserved melon shavings, melon juice, honey and mint. Process until smooth. Pour over balled melon, tossing to coat. Pour into decorated shell and place on a plate to serve. 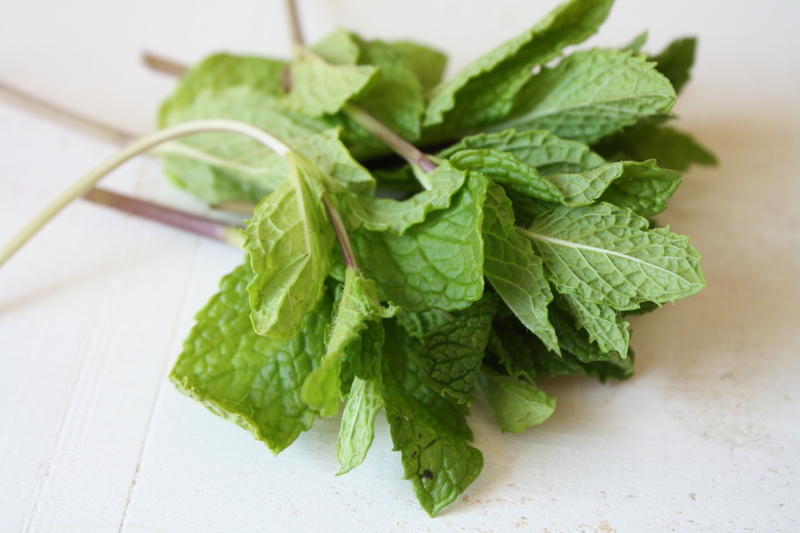 Garnish with fresh mint if desired. Enjoy! Best if made the day before for flavors to blend. Add to shell just before serving.